Kami-Sama was a game that I first encountered at SPIEL 2017. I had a great little sit down meeting with the folks for Kolossal Games, a fledgling company at the time. They have big plans for the year, with their market plan revolving around using Kickstarter. I got a sneak peek at a few of their early titles, and I was quite intrigued at the short demo I got of Kami-Sama. The art was awesome, the proposed bits looked pretty swell, and the demo of gameplay that I had looked to by up my alley. The folks behind the company have a long track record in the gaming industry, and I have always had a great deal of respect for the games that Travis Chance has worked on (Aeon’s End, Heroes Wanted, etc.) from Action Point Games. Additionally, some of the other players have their roots with Matagot, another company which has a proven track record. This combination of talent gives me a fair amount of confidence that the new company will choose good games and produce them well. I was sent a pre-production copy of the game; in fact, when I received the game, the KS campaign had not yet even started. Obviously, I can only comment on the game version which I received, and I should make it clear that there are possibly going to be changes in the final product and ruleset as the game evolves. 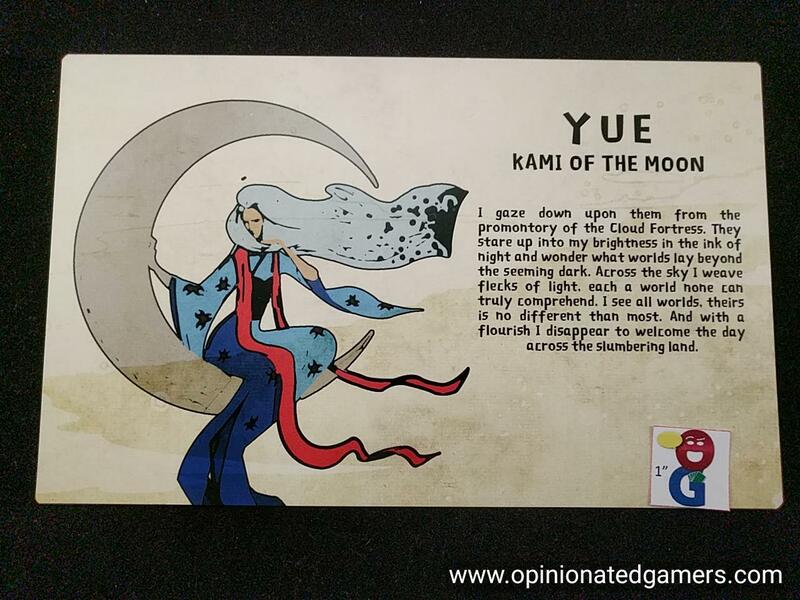 In the game, players are Kami, or Japanese Spirits, who are fighting for the honor of being Kami-Sama – chief deity of the four rural villages that they inhabit. My box contains 8 Kami player boards, each with three unique actions on them. Each player will get one Kami at the start of the game. In addition to the three unique actions, each Kami has a unique ongoing ability for the entire game. There are two scoring tracks at the top of this board (Nature / Favor), and you get a marker for each one. You also get a supply of Shrine pieces and action cubes in your color. 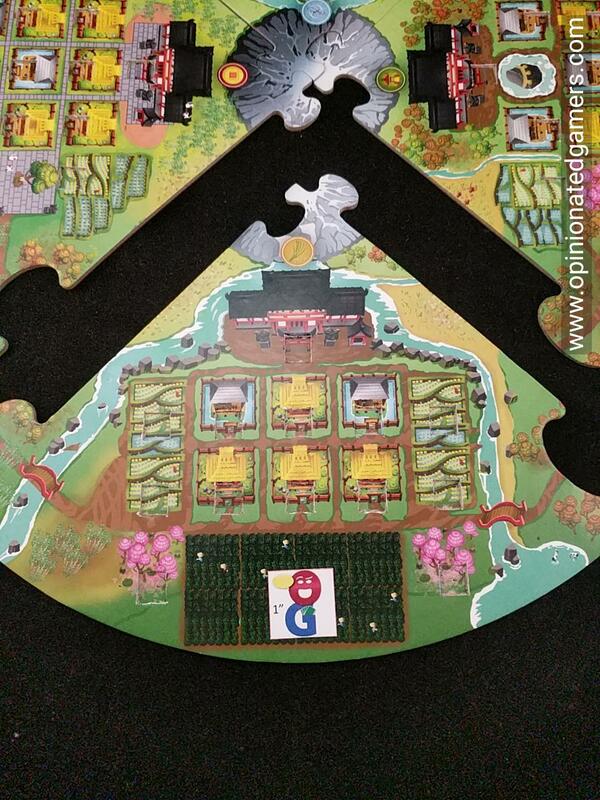 The main board is a circular affair with each of the four villages on a quarter circle puzzle piece. The chosen start player always has the Village quadrant in front of them to start. Each quadrant has a slightly different arrangement of shrine spaces – indentations in the double layered board – there are five different types of spaces. A deck of cards goes with each village, and these are shuffled and placed next to the score track. 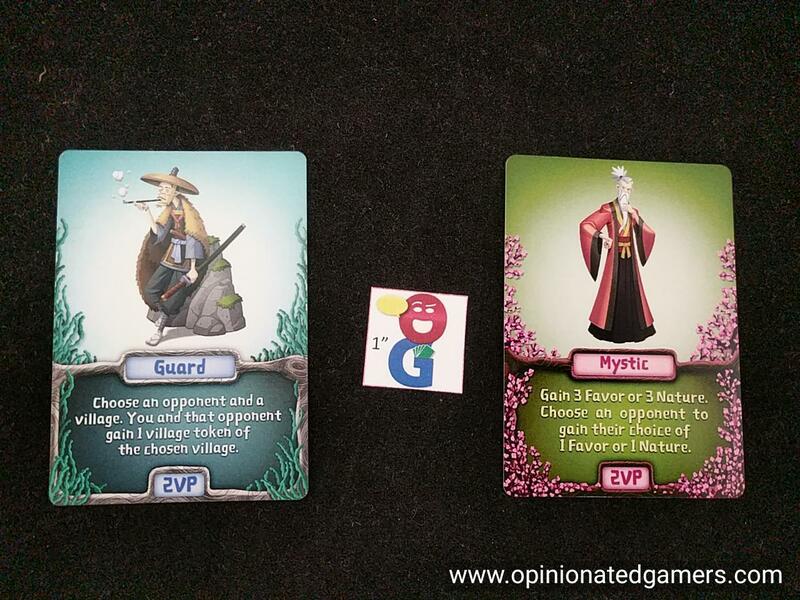 There are also tokens associated with each village, they are placed in a supply. Finally, three goal cards are randomly chosen, one for each of the three rounds in the game. 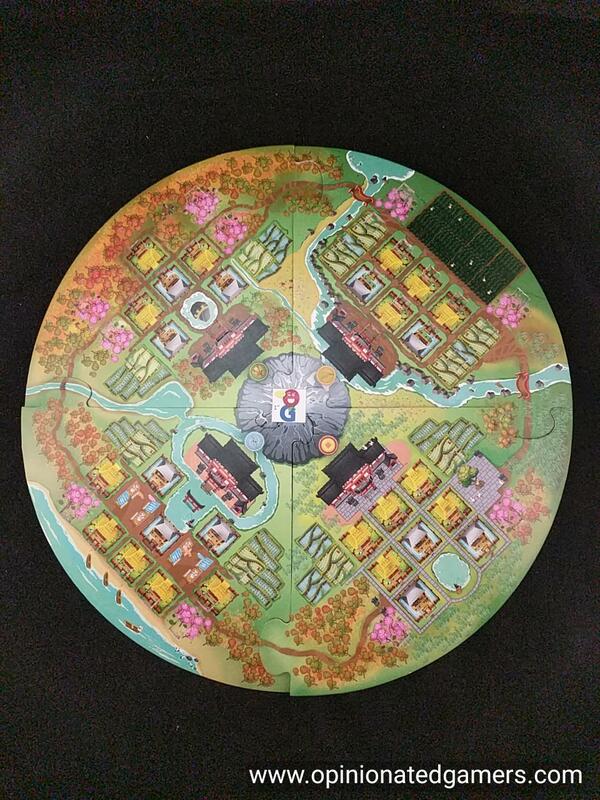 The game is played over three rounds, with each player getting one turn in each village per round – thus a total of 12 turns for each player in the game. At the start of each round, the Goal card for that year is revealed. Additionally, if your Kami’s ongoing action takes effect now, you should do it before the round starts. At any time, there will be a board quadrant which is sitting directly in front of a player – this is considered to be his active quadrant, and most of his actions (but not all) will take place there. In each player turn, a player will take all of his allotted actions (3 in round one, 4 in round 2, and 5 in the final round) with the board being rotated one quarter turn after each set of player turns. 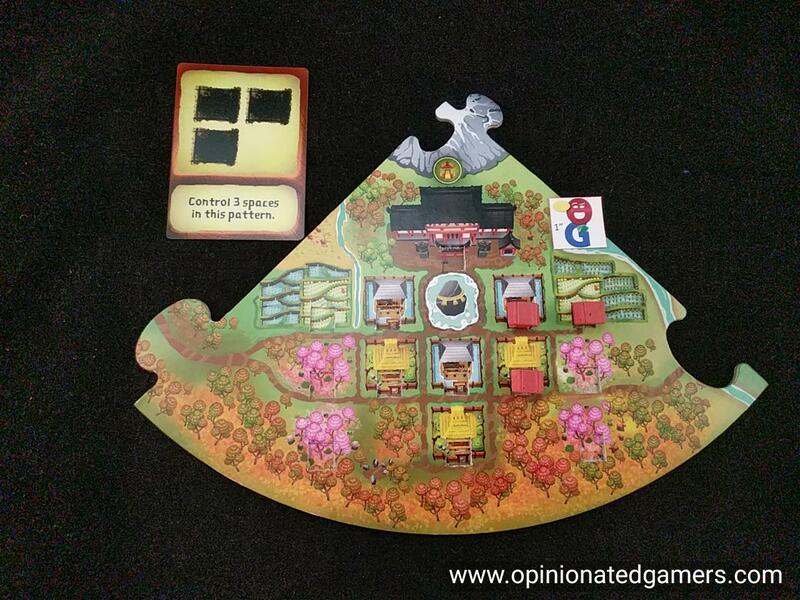 In this way, each player gets to have a turn with each village as the active quadrant once in each year. There is some interim scoring at the end of each round as well as a little end game scoring. ADD a shrine – take a shrine from your supply and place it in an unoccupied space. This usually happens in your active area unless directed otherwise. 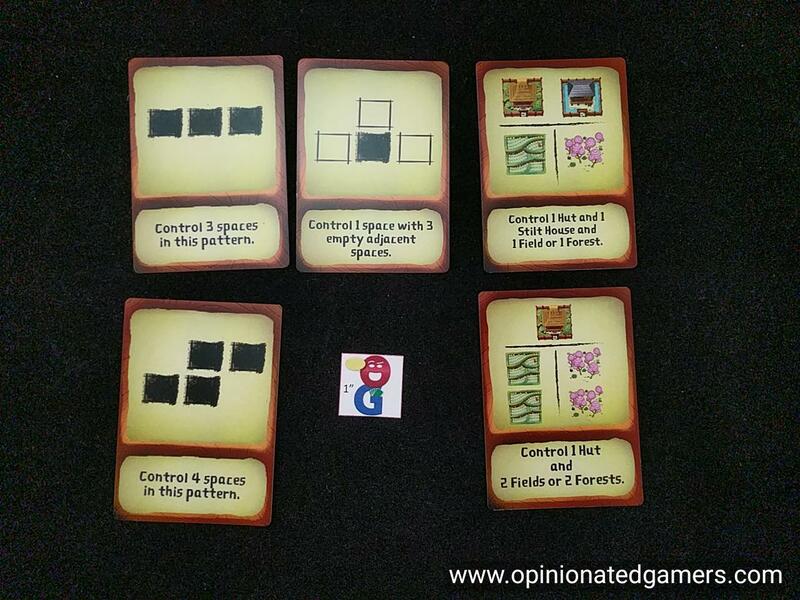 Depending on where you place the piece, you could gain Favor or Nature points to be marked on your Kami board tracks. Fields gain 2 Favor, Forest gains 2 Nature, Temples gain 1 of either type… Huts and Stilt Houses gain you nothing. REARRANGE shrines – take a specified number of shrines from the board and rearrange them in any way back into the locations where they came from. No Favor or Nature is gained. The Kami abilities all are combinations of the above basic actions, and many of them can cause other players to take actions with their shrines. If another player is asked to ADD one of their shrines, they would still get any Favor/Nature bonuses due to the placement. Again, a player’s turn consists of the player using all of his action cubes in order to manipulate the shrines on the board. At any time during turn, if he has managed to create a pattern of his shrines which match the pattern on the Goal card for the year, he will gain a village token for the specific village in which he made the matching pattern. You can gain one token per village per turn. Note that you can only claim them on your active turn. The village tokens are worth 1VP each at the end of the game, and anytime that you have a full set of four village tokens, you must turn them in for 6VP. When the player has used all of his cubes, the next player in clockwise order starts his turn. Example of a goal card – here red has placed three shrines and matches the pattern. After all the players have taken a turn for the year, there is a break for scoring. First, each village is evaluated to see who has the most influence. A player’s influence is equal to the number of shrines they have in a single orthogonally contiguous group in that village. If there is a tie, the player who has a shrine in the Temple space of that village determines the winner – even if they are not one of the players involved in the tie. 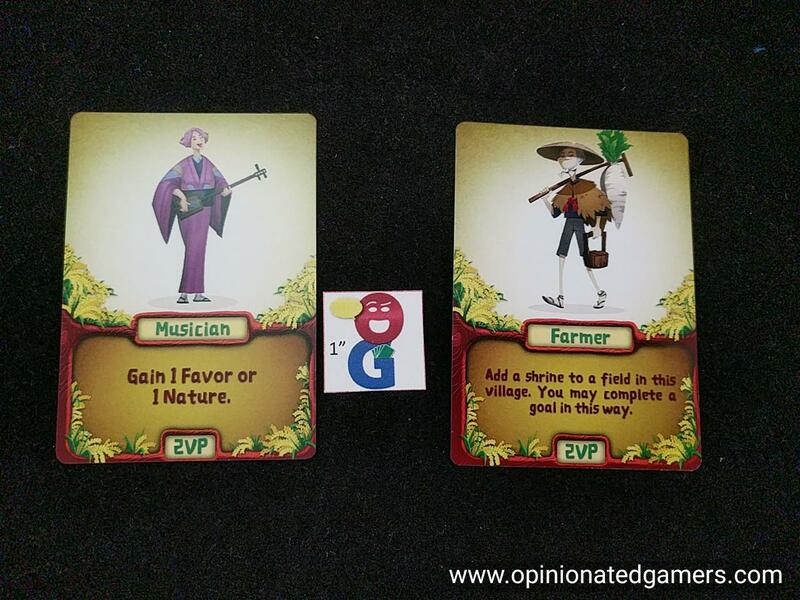 Once the ranked order of players is set, the first player in that village draws cards equal to the number of players from the corresponding village card deck. He looks at all of them and chooses one to play. There are two parts to the card – a “claim action” which is found in the center of the card which happens immediately as well as a victory point bonus which will be tallied in the end game. Once the first player has chosen a card and enacted the claim action, the remainder of the cards are given to the next player in influence order. 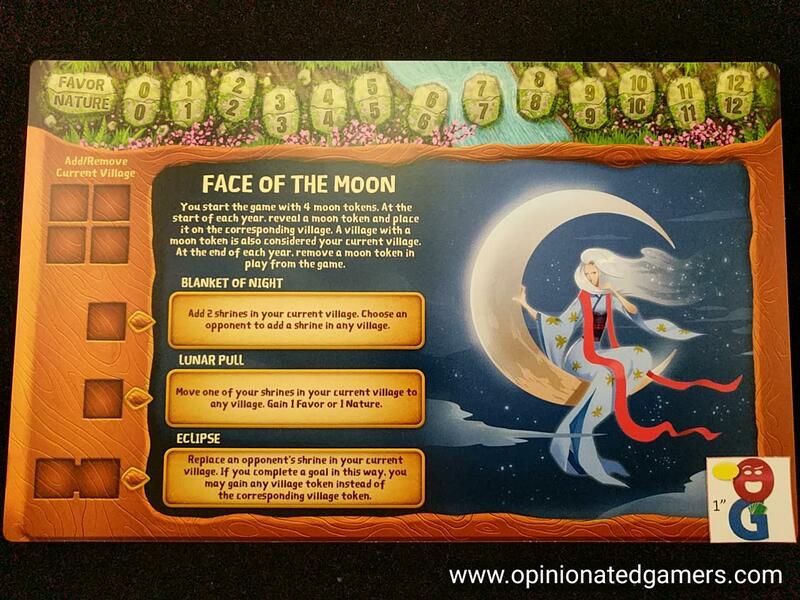 This continues until all players who have a shrine in the village have had a chance to choose a card. Repeat this process for the other three villages. Next, each player scores their Favor and Nature tracks. You simply look at your tracks and score VPs equal to the lower number of the two tracks. Move your VP marker on the score track and then reset both of the Favor and Nature markers to zero. Then, set up for the next year by giving each player another action marker cube. Discard the current goal card and flip up the card for the next year. Finally, turn the board an additional quarter turn, and the player who has the farming village in front of them gets to start the next round. At the end of the third round, you still complete the regular scoring with the card drafting and scoring for the Nature/Favor tracks. 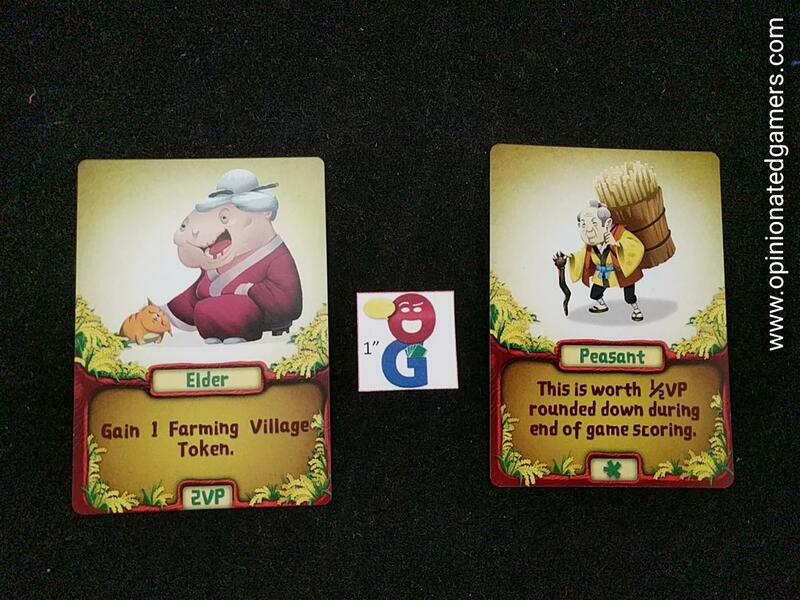 After this is complete, there is a bit of final scoring with each player receiving 1VP for each Village token they still have as well as receiving the points on each of the collected Village cards. The player with the most points wins. If there is a tie, the player with the most Village tokens remaining at the end of the game is the winner. As I mentioned earlier, I was pretty interested in the game when I got a short demo at SPIEL 2017, and the game has lived up to most of my expectations thus far. Again, I can only make comments on the version which I have, and this may or may not be indicative of the final product. Our first game was honestly a bit rocky due to many rules questions and inconsistencies, but later games with an updated set of rules provided a much more polished experience. I’d guess that there will still be some tweaks along the way, but the core of the game is likely finished at this point. The game is an area-control game with a twist. Each turn, you have the opportunity to change the Shrine situation on the board. You have a few competing goals though. You might try to get your shrines in position to score the goal card condition; at a minimum, you would score 1VP for that token. You might also be trying to gain influence in the village by having the largest contiguous group as this will give you the best choice in villager card at the end of the round. Finally, as you are forced to use all of your action cubes each turn, if you have no better play, you can at least rearrange the Shrines to make it as difficult as possible for your opponents to do well on their turns. So – you are trying to get your pieces in the right places in each village, but you don’t necessarily have to have the most shrines to do well. Also, the conditions constantly change given the different goal cards each round. As you can see, there is definitely a take-that or targeted action element to the game. At least one of the players in my group felt that there was too much of this in the game for their tastes. I didn’t see that as a big deal – many of the negative actions (removing someone else’s shrine, for instance) feel more dictated by the position on the board rather than the owner of that piece. Otherwise, many of the other options which have a player choosing an opponent are usually for a positive move (i.e. choose one of your opponents to place an extra Shrine) – which while still targeted, feels less punishing than a penalty that only affects one player. For me, this gives the game a bit of needed interaction between players as otherwise it would be a slow simultaneous solitaire game. Speaking of game speed… The box/rules I currently have rates the game at 45-60 minutes. After my games, I frankly do not see how this is possible. In a 4p game, there are 48 player turns total. The first 8 to 12 player turns are fairly quick as there aren’t a lot of obstructions on the board to play around – usually you can just plunk down shrines in empty spaces to gain the goal for that village… but by the 2nd or 3rd season of year 1, we’re taking a bit of time to figure out our options. There are a LOT of options to consider, especially if you have actions which can affect other villages. Additionally, as many kami actions affect quadrants other than the one right in front of the active player, you often can’t start planning until it’s your turn. By the time you get to the 3rd year, the turns can actually can get pretty long for us – 90-120 seconds is not uncommon. Sure, there are times that no one messes with the village in front of you, and you have already mentally made a plan, but usually that isn’t the case. Overall, I’d say we’re usually looking at a minimum of 1 min per turn on average thru the game, 48 min total. Then, between years, you have to calculate the draft priority and then draft village cards. That is usually taking 2-3 min total per quadrant, so say 10 min between each round to do all of that, including scoring the tracks, etc. Again, in the draft, you can’t do anything until you actually get the cards, and you have to do them in order as 1) the rules tell you to do so, 2) some cards can change the board state, and 3) some claim actions will change what you would choose in a later group. Furthermore, the game provides each Kami with asymmetric powers, so thus far, every game that I’ve played has been a learning game of some sort – it takes a bit of thinking and skill to figure out how to best leverage your unique actions/abilities. You particular strategy in each game will be shaped in part by your actions as well as those of the other Kami in your game. Finding a niche that only you can operate in will be a great advantage. So, our most recent game, with 3 people knowing the rules out of 4 came in at 92 minutes – that’s after rules and questions; that is only game play time. Despite the somewhat long game length, the game can still engage the non-active player as there is always the possibility of you being able to place a Shrine on another player’s turn. While it never hurts to start planning ahead – you likely can’t make a final plan until you see the board state at the start of your turn. My non-turns end up being a combination of attempting future planning and a bit of kibitzing with other non-active players. It feels like one of the old-school Kramer/Kiesling Mask games – you know, where you can stare at the board in Tikal or Java all you want, but really, in order to make the best play possible, you simply have to wait until you can see the board state to plan out your turn. Even if you have made a good plan in your head, and no one has messed with your area, you’ll always want to take a step back and see if there isn’t some sort of better play which is available to you when it’s your turn to make a decision. Our first game was played in silence as we were all thinking; our second was played with a fair amount of chatter between players as we caught up with each other. The game is a bit long for my tastes for the weight of the game, but I also suspect that our play time would decrease a bit with further familiarity with the game. We still spend plenty of time trying to parse out the special actions of our Kami’s, as we are essentially getting a new character each time we play. I also sincerely hope that the game designer/developer add in a player aid card. Even after multiple games, there are still times where players have to be reminded which spaces grant Favor or Nature, or which actions allow collection of Favor/Nature and which do not. 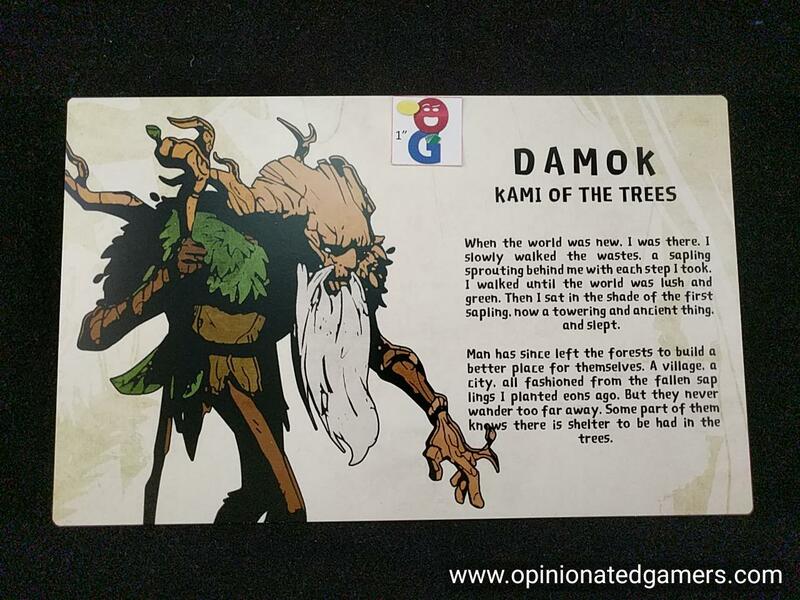 This would be a simple addition, whether as a player aid, a graphic on the Kami board, or an additional graphic to the board sections which would greatly improve the game flow and speed. 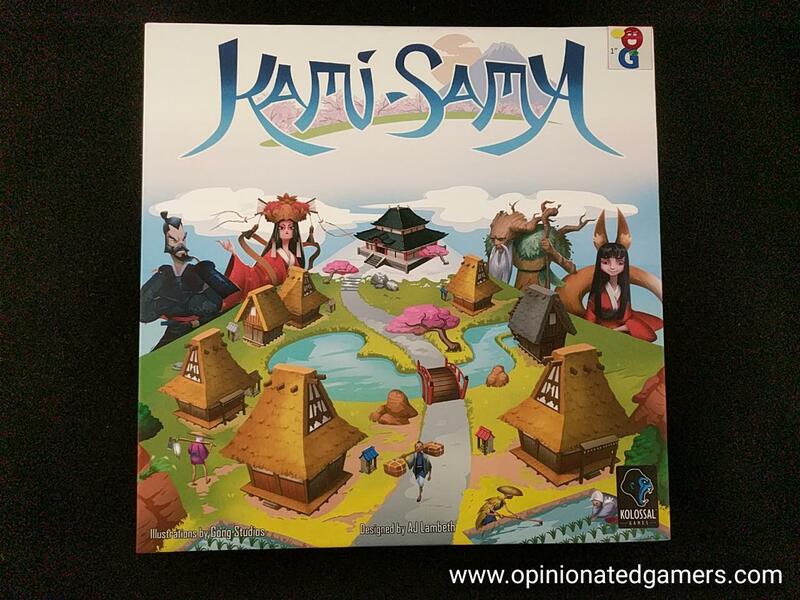 Thus far, Kami-Sama has turned into a solid game after my initial plays – there is a depth to the strategy which I am still learning about; but the fact that I still want to explore it after the first week’s worth of games is a big positive. 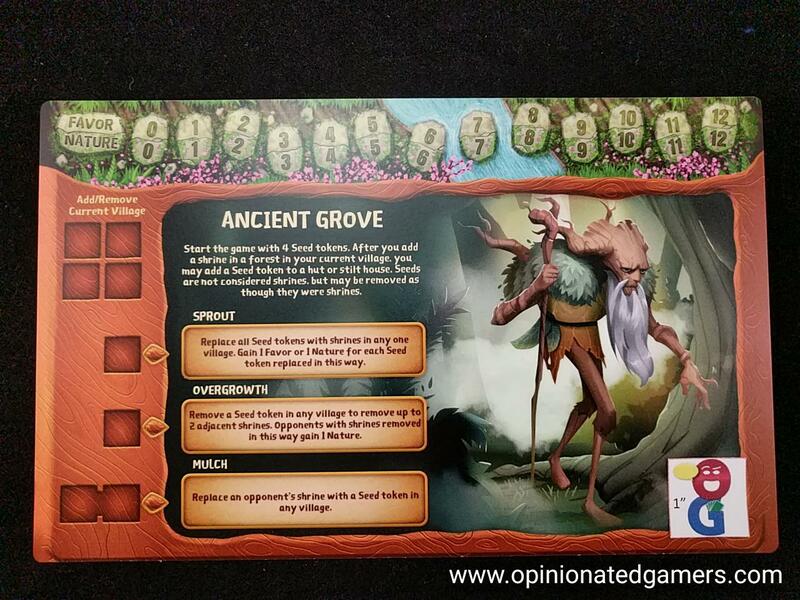 The artwork that I’ve seen so far looks nice – it’s done by Gong Studios, who has also done Charterstone of recent note… The components, like most KS games, are up in the air as far as how bling-y they will end up based on various stretch goals – as I have a prototype, I really can’t judge that in any way. The game is light on the complexity spectrum, but I would judge this to be slightly more than family/gateway due to the asymmetrical powers as well as the slightly long play time. I’ll be interested to see how the final project turns out when the work on the game is complete, and this is one I’ll want to play the final version to see how it ended up assuming that the Kickstarter campaign is successful.